Scope: Installation of new cable plant - CAT 6a, fiber plant 50/125 micron multimode, core drilling, conduit, cable tray/ladder and cable race installations, furnish and install 20KVA un-interrupted power supply (UPS) and associated wiring and devices to support reliable power to the telecommunications system. Scope: RJS was the Prime Contractor for complete removal of painted markings and blackout of painted markings. Captured, analyzed, and disposed of all associated debris and wastewater; controlled particulate matter during paint removal; method(s) of waste characterization; and helped determine capture and disposal methods. To avoid damaging the asphalt, all paint removal on asphalt pavements was done by grinding. Laid out work for new markings on specified areas of the airfield. Provided traffic paint, reflective media and non-skid media in designated areas. Provided two coats of paint on all new paint areas and areas where paint was removed and being replaced. Provided one coat on areas with existing paint (not being removed). Protected traffic paint until dry and hardened sufficiently to withstand traffic. Several government employees, including Contracting, CE, and Airfield Management, stated that the quality was top notch and the best they have seen in years. It was further, specifically stated that this was the best striping project the end user had to date. Scope: This Design-Build project included the fabrication, delivery, anchoring and float testing of a new 42 space, moorage dock system and gangway at Lake Roosevelt, 25 miles north of Wilbur, WA on the beautiful Columbia River. The Keller Ferry Marina Dock & Slip Replacement project is a great example of RJS’ diverse construction experience. It is also an example of RJS’ ability to understand a client’s situation and needs, assemble the best team to design a solution, develop costs for that design that fits the client’s budget, then complete the project in a way that exceeds the client’s expectations for quality and service. 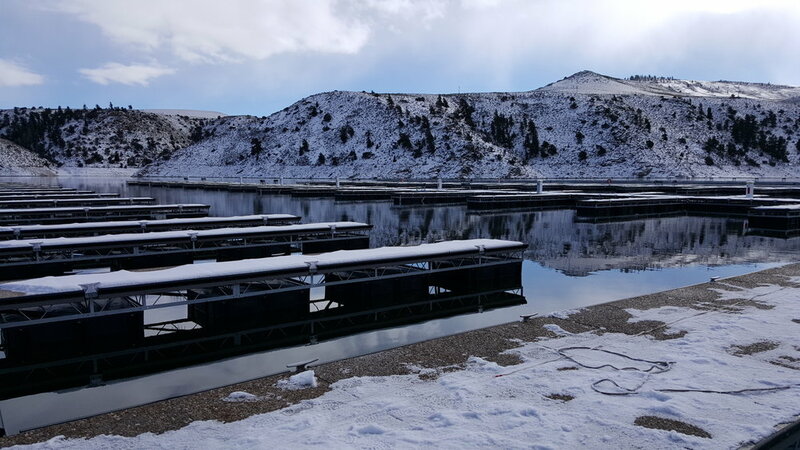 Scope: This project was a design build for the Elk Creek Marina Dock Upgrades at Curecanti National Recreation Area. Design replacement dock, new dock, and connecting walkway to connect existing docks, match new docks to existing West Dock, design power to 13 double slips, and design anchoring system to withstand: high winds, feezing, and large vertical and horizontal movement. Scope: RJS provided Design-Build services for the replacement of an existing deteriorating roof system, design and fabrication of louver system, installation of a communication antenna infrastructure and provided skylight cleaning. 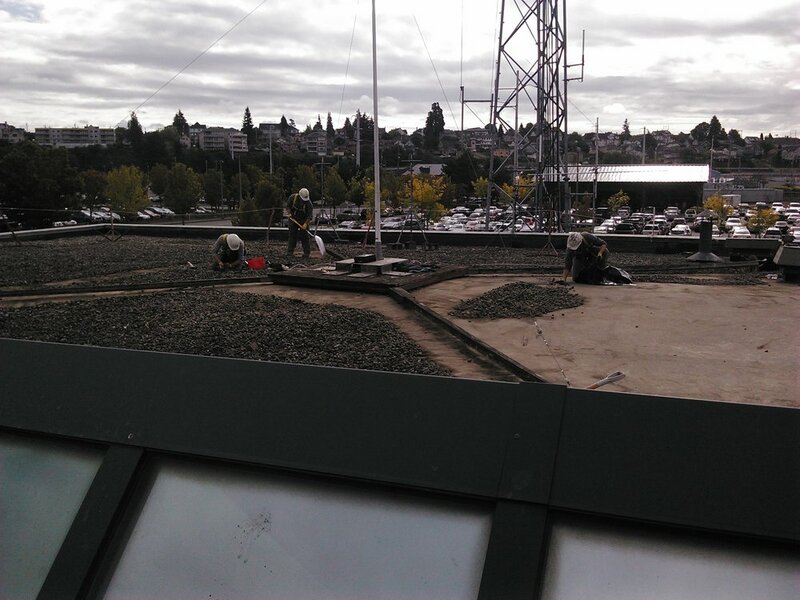 The project consisted of the tear off and installation of a new 9,000 sf ballasted over EPDM roof system on the fire safety building located on the Everett Navy Station. The new roof design included the addition of roof crickets to allow easier roof drainage and also included additional insulation to increase the R-value. The SOW also included the design and fabrication of two hoods to protect the existing louver system. The hoods design required maintaining proper airflow into the mechanical room. In addition RJS provided cleaning services of the existing skylights in the building hallway. The skylights required scraping and general glass cleaning to rejuvenate their original clarity. SCOPE: Removed and replaced a concrete sidewalk/bus off loading ramp, at the Oroville Boarder Station. The existing colored concrete sidewalk was damaged and needed to be replaced. RJS removed the existing sidewalk and poured new colored concrete to match the existing sidewalks. SCOPE: Installed audio visual infrastructure for a court room in Spokane, WA. Conduit runs were made within the Judge, Recorder, and Clerk's desks. New carpeted was installed in the elevated areas of the court room. All penetrations were fire caulked. SCOPE: Provided Design-Build services for the renovation of existing space and relocation of Customs and Border Protection (CBP) personnel and assets. The project included the renovation of approximately 5,000 square feet of existing space to accommodate the CBP Air Marine Branch. The project also included the design and construction of new security systems to include CCTV, Intrusion Detection & Access Control. RJS also provided the design & space planning to utilize existing furniture. SCOPE: Moved and replaced all furnishings, equipment, and supplies. Removed covers on existing flush floor outlets and re-installed cover plates upon completion of work. Install high performance solid robber floor tile with raise features. Prepared walled and provided and installed new rubber base molding. SCOPE: Roadway subbase construction, base prep with asphalt paving, and the armoring of the river, with riprap and stream barbs. Constructing a paved bypass where a road had washed out and armoring the bank to prevent further erosion. Construction of 900ft of road including managing the flow of traffic during all phases of construction. The surface had to be raised several feet in some locations to support the new road alignment. The project included the construction of one drainage culvert under the road. SCOPE: Complete interior renovation of 1000sf comfort station. Replacing and repairing interior walls with FRP over top of CMU, concrete floor demo, new concrete stained and sealed flooring, and total window replacement included all new window framing. Project also included completely new exhaust system, heating system, plumbing fixtures, piping and drains as well as total removal and replacement with new ADA and non-ADA restroom partitions, vanities, lavatories, toilet fixtures, urinal fixtures, light bars, hand dryers, changing stations, and bathroom accessories. SCOPE: Rehabilitated portions of the Far View sewer system at Mesa Verde National Park; rehabilitated lining mainly 4-inch vitrified clay pipe & some 6-inch cast iron pipe using a cured in place pipe lining process. Work also included open excavation installation of PVC pipe where necessary & manhole installation & lining. Included in the project was the demolition of a lift station and installation of a manhole at the Chapin Mesa CCC area. SCOPE: Project included the fabrication, delivery, anchoring and float testing of a new 42 space, moorage dock system and gangway. 42 new slips ranging in length from 25’–35’, 1 fixed and 1 hinged gangway. Utility pedestals at each slip that included potable water & 30amp electrical hook-up. Design accommodated 20’ of elevation change & extremely high winds. Galvanized steel dock frames. Security gate at gangway entrance. SCOPE: The purpose of this Negotiated Bid-Build project was to improve security and control access to the Chemawa Indian School in Salem, Oregon. The existing guard shack for the site was located at the far end of a 600-foot driveway and very close to a busy county road. Installing a new, owner-provided guard shack allowed vehicles to pull off of the road while waiting to be screened by the security guard. RJS was the prime contractor. SCOPE: RJS was the Prime Contractor for the repair and renovation of the concession stand at the Chemawa Indian School campus. Scope included: removal of the existing roofing and T&G wood decking, addition of metal roof decking, renovation of the existing concession area and restrooms, custom casework, epoxy flooring, FRP wall panels, H/M doors and jambs, hardware, glazing, overhead door, LED lighting, architectural concrete, new masonry, asphalt, & concrete paving, addition of (2) new ADA compatible rest rooms, new storage rooms, and electrical system upgrade including CCTV. Self-performance included, project supervision, quality control management, temporary power, painting, and selective demolition. SCOPE: his project consisted of providing and installing (4) residential units, including (2) three bedroom and (2) two bedroom modular units for the Bureau of Indian Affairs in Busby, MT. These modular buildings are wood framed and have asphalt shingle roofing, Hardie-lap siding, Milgard windows, linoleum flooring, laminated hardwood flooring, ceramic tile counter-top and back-splash, residential appliances, oak cabinets, handgun safes, photo-voltaic roof panels, low voltage including communications and safety and security, fire suppression system, and site built entry porches with metal railings and composite decking. RJS raised the elevation 4’ for this complex. Site improvements included exterior concrete sidewalk and driveway, site grading, retaining walls, hydro-seeding, propane tanks, utilities, and a central pump house for the fire suppression system. The foundation and crawl space had several special requirements do to this location’s climate. SCOPE: The intent of this project was to install a programmed system to maintain an equilibrium balance of velocity of flow & volume to mimic a natural habitat for native fish species in an adult Fishway at Little Goose Dam & Lock on the Snake River. The scope of work for this exciting design-build project included the demolition of the existing system and the design and installation of a weir gate monitoring and control system that allows for a (HMI) Human/Machine-Interface control screen, bringing four control stations to one location. SCOPE: 17 wood and concrete structures and 2 steel buildings for an urban assault training course for the Yakima Training Center. Work was performed next to a live fire training center. SCOPE: RJS was the Prime Contractor for this Design Build Contract consisting of the removal and replacement of a 40,000SF standing seam metal roof system. System components included a redesigned/modified fall protection system, installation of Bird Deterrent, flashing including but not limited to fascia, ridgelines and troughs, 3” rigid board insulation, and a 22 gauge, stainless steel gutter and downspout system with factory applied color coating. RJS self-performed 18%, including selective demo, misc. carpentry, quality control, safety oversight and engineering. SCOPE: Provide and install a complete and functional IDS (ESS per Army) in Armory Room 127 of the Marine Training Reserve Center. SCOPE: RJS was the Prime Contractor for this multi-phased, Design-Build installation of a new thermoplastic polyolefin (TPO) Membrane over the existing Ethylene Propylene Diene Terpolymer membrane (EPDM) roofing system and installation of a new EVAPCO cooling tower to replace an existing unit at USDA, ARS, Temperate Tree Fruit & Vegetable Research (TTFVR), Wapato. The client originally approached RJS with a request for a price for an elastomeric roof coating. After consulting with several roofing contractors and design firms, RJS concluded that the best option was to leave the existing EPDM roof system and cover it with a new TPO Membrane. By switching to this design specification, RJS saved the client over thirty percent of construction costs. This change in design allowed the construction to successfully take place during the wet season of the year without having to remove the existing roofing. This approach prevented exposing the occupied building to potential leaks and damages. The USDA Research Facility housed a temperature and moisture sensitive agricultural specimens that contained over $1M worth of inventory and it was crucial to keep the weather conditions in check. RJS coordinated the cooling tower replacement and roofing upgrades to ensure that the temperature and moisture contents in the facility remained within specific and sensitive parameters. SCOPE: Modernize an existing Dover/ThyssenKrupp Elevator by replacing the main pump, control systems as well as bringing the cab interior and exteriors up to current code. As a separate part of this project, the machine equipment rooms for this as well as a second elevator, will be brought up to current elevator machine equipment room code requirements. Also entails bringing the elevator hoistway, machine room, electrical and fire alarm system up to State and JHA code. Improvements include electronic door edges, emergency lighting, ADA “hands free telephone” and LED position indicator bulbs. SCOPE: The principle physical components of the project included repairing of damage resulting from erosion at multiple locations in and around an active substation, various rip-rap placements including bedding and geotextile fabric, installation of a new concrete trench drain structure, other miscellaneous drainage revisions, gravel surfacing and miscellaneous grading. All work was conducted at a remote site. The principle administrative components of the project included the preparation of a site specific Safety and Health plan, preparation of an acceptable construction schedule (critical for coordinating with WAPA personnel including inspectors), pricing of Owner requested modifications and post construction close out. SCOPE: Removing four existing transformer structure foundations, eight existing breaker foundations, four existing transformer foundations and one existing bus support foundation; constructing one replacement transformer foundation, four transformer structure foundations, four circuit breaker foundations and one tee pole foundation; and associated conduit and grounding for electrical equipment. SCOPE: The principle physical component of the project was the construction of a pad at the west base of Structure 65/4 (a high tension tower) suitable for supporting the large crane to be utilized in the demolition of the structure. The structure, at the time of the pad construction, was surrounded by and standing in water up to six feet in depth. Work included restoration of land disturbed by construction operations to its former condition. All work was conducted safely and timely at a remote site. The principle administrative components of the project included the preparation of a site specific Safety and Health plan, preparation of an acceptable construction schedule (critical for coordinating with WAPA personnel including inspectors) and post construction close out.